In trying to save money for Christmas, I decided to make many of my Christmas gifts. In the end, I am not sure if I spent any less over all, but I had SO much more fun. (And the recipients really seemed to enjoy their gifts that much more). I will definitely say that I plan on making at least some of my Christmas gifts EVERY year now. You can either buy something you like at a thrift store, yard sale, TJ MAX, etc. 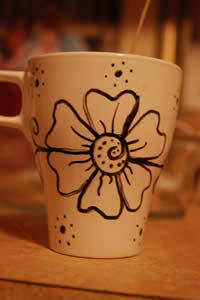 OR you can design your own mugs which is way more fun! This paint pen from BLICK (although you may be able to find it at other art stores). 3. Place in oven at 300 degrees for 30 minutes. 4. Turn oven off and allow mugs to cool gradually. 5. 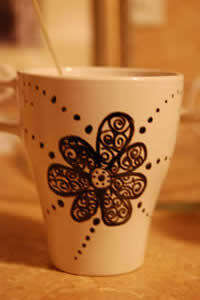 Move on to step 2…making them into candles OR these can be used just as regular mugs for cocoa, tea, coffee, etc. 3. 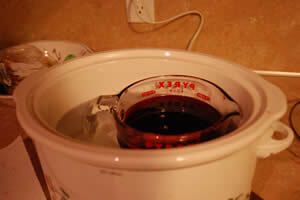 Put container of wax into a crockpot full of water. This melts the wax easily, but not quickly. Plan on it taking several hours depending on the size of the wax. (The house sure smelled great through this process, though). 4. 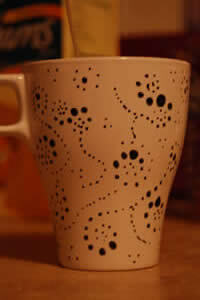 Hot glue wicks (can be found at craft store) to center of bottom of mug/ tea cup. 5. Pour wax into mug leaving probably 1/2 inch at top. 6. To keep wick standing up straight, I used a piece of paper with a hole in it. Put the wick through the hole, and put it where i wanted it. I’m sure there is a more techinal and efficient way to do it, but this worked for me! 7. 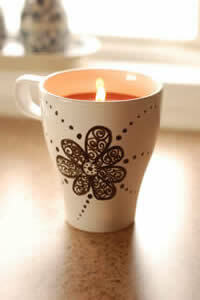 Once wax is dry, cut wick down to desired height. Then ENJOY!